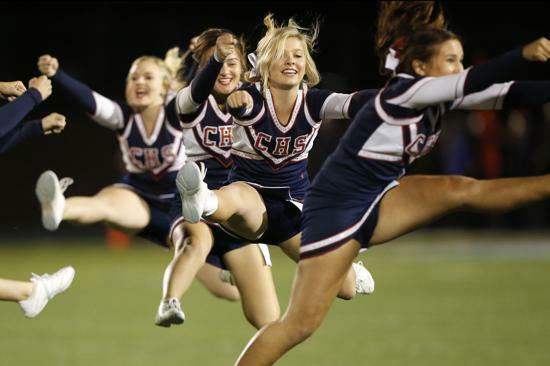 Christian High School's cheerleaders preform at half-time during Bishops football game against Christian High School at Granite Hills Friday night. A hearing in San Diego Superior Court, Department 67, supported the CIF's interpretation of selection criteria for entrance into the state playoffs, ruling against Christian High. A press release from the State CIF office, said the court "denied the request for injunctive relief filed by Christian Unified School District and Zane Coffman." Coffman was the attorney representing the school. Judge William S. Dato presided over the hearing. The Patriots (12-1), the San Diego Section Division III champion, were seeking to enter the playoffs as a Division IV team at the state level. "We're disappointed," said Christian Athletic Director David Beeser. "But we're proud of what the kids accomplished. "What we accomplished was a great example of David vs. Goliath. At the end of the day we did the impossible. No one ever thought a school of under 500 students could accomplish what we did." There were conflicting written reports, saying the San Diego Section Division III champion would play up to Division II at the state level. But there was also written report that said if the Division III winner had few than 500 students, it would play down to Division IV for state purposes. Christian has fewer than 400 students. "It's extremely disappointing that the CIF had to spend thousands of dollars in this legal action that could have been better spent in providing educational programs to the 1,547 member high school and nearly 800,000 participating student-athletes," CIF Executive Director Roger Blake said in a statement. The 10 CIF commissioners chose West Hills Chaminade (12-2) and Newhall Hart (12-2) to play in the Division II Southern California Regional. View Park (13-0), the L.A. City Section champion will meet Bakersfield Christian (11-2), the Central Section champion in the Division IV Regional on Friday at Centennial High in Bakersfield. "The bottomline, is that we're a Christian school, a faith-based school," Beeser said. "So we accept the court's decision. "Maybe God has a plan. Maybe we would have gotten a player seriously hurt if we had played. "I think our players will handle the decision just fine. You can't have the kind of success we had without extreme-character kids. "What we want to remember is that last time we were together (Saturday night at San Diego Mesa College after a win over San Marcos in the San Diego Section Division III title game) we were a family, and we were all smiles."